One of the most remarkable aspects of the National typewriter is the compactness of its design. The machine looks as if one should be able to store it in a corner of a desk, right behind the family portrait. Being so compact, it would have been extremely difficult to repair any broken parts, had not the inventor, Henry Unz, produced the machine in such a way that the entire keyboard and type basket can be removed from the machine. In fact, two National typewriters were produced. The major difference between the earlier model (as seen here) and the later one is the size of the space bar, and the width of the ribbon. The earlier model had a very small space bar and a half inch ribbon. The later model had a full sized space bar and a 3/4 inch ribbon. The National is an upstrike typewriter with a double shift. The shift in fact moves the entire keyboard and type basket forward, while the carriage stays in place. 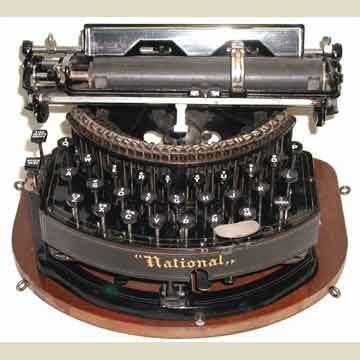 There is no connection between the 1889 National and the National Portable typewriter that appeared in 1916.